Earl "Lucky" Teter was a race driver of both autos and motorcycles. He earned a wide reputation as a stunt driver with a group called 'Lucky' Teter's Hell Drivers. As former gas station attendant and weekend test driver, Lucky decided to try his hand at the thrill driving trade during the early 1930s. In 1934, Lucky assembled a small group of individuals and put his 'Hell Drivers' on the road. It was the first time the auto thrill show was conceived as a traveling attraction. The show consisted of many of the same stunts already established by the Ward Beam thrill show, however the 'Hell Drivers' developed new events. Lucky added the precision driving of new automobiles over elevated ramps, reverse spins, and added stuntmen to the show acting as 'daredevil clowns'. By the late 1930's, Lucky had started performing a ramp to ramp jump over a large truck or transcontinental bus. It was this feat that took Lucky's life in 1942, in what was said to be his last performance before he was to join the Army during World War II. Lucky Teter also raced in the 1939 Indy 500. His family was from Noblesville Indiana along the White River. Lucky died in 1942. His parents passed in the 1960s and his sister, Ruth died in 1981. As there were no heirs to the family farm, Ruth bequeathed the property to the Methodist Church, which dedicated the 120 acre farm to her parents and it became known as the Teter Family Retreat. Hell Drivers - The frequently used term to describe, and the very popular title of, numerous automobile thrill-based productions performing at fairs and racetracks by various squads of stunt drivers since the 1930's. 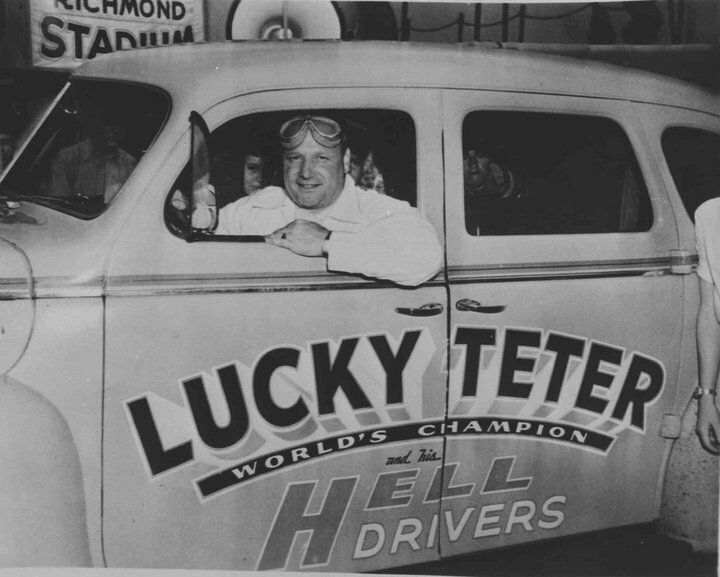 Earl "Lucky" Teter was the first to coin the phrase Hell Drivers, when began touring his show in 1934. Hell Drivers provided massive audiences with an always exciting show filled with precision driving and deliberate crashes. Featured stunts included driving cars on two wheels, crashing through flaming barricades, and jumping an automobile ramp to ramp through mid air. For many years, Hell Drivers were used to demonstrate the dependability of a manufacturers automotive product. Major Hell Driver automotive sponsors have included Chevrolet, Dodge, Chrysler, Ford, AMC, Nash, and Toyota. © 2010 - 2018 www.LuckyTeterRebelRun.com All Rights Reserved.